As the day dawned on Sunday 24th July, we just hoped the weather would be kind to us; we need not have worried. What a beautiful day, just right for walking. I raised the idea for a sponsored walk in October 2010 and by February 2011 we had permission from the relevant authorities to go ahead. We had approval from the local council, the environment people, and the police. We were restricted in where we could walk, they would only let us have a guided walk but we were pleased with their response and advice. There was still a great deal to do before we could go ahead and notify our members of the event. At this point it was decided to organise a sub-committee made up of myself, Emma, Natasha and Marilyn. We agreed to hold the meetings at a place that, travel wise, would be convenient for all of us and agreed on the Fox & Duck in Stotfold (of course we weren’t swayed by the availability of a bite to eat and a little light refreshment).We agreed to turn the event into a social gathering by offering a reasonably priced burger or veggie lunch with sundry salad bowls. We hoped the result would be that some of our newer members will now be able to put faces to names.Our next task was to source advertising from local newspapers or village mags., hopefully at a ‘bargain basement’ cost! We had an excellent response from Herts Mercury, Hormead Newsletter and Baldock Mail, all of whom asked us to submit an article to avoid any cost. This led to a small local news station asking me if I would ‘go on air’ (be interviewed) and explain the whys and wherefores of the charity.Our flyers were then designed and printed, as were the sponsor forms. The documents were posted to our members and all we had to do was to wait, and wait, and wait. After a slow start the forms started to be returned and by the day of the event we were delighted to have registered 40 walkers. There were then another ten who registered on the day. As part of the approvals the Countryside Officer needed to check our route a few days before the event. I met up with him a week before and we walked the route together. He was very pleased to pass us but insisted that nettles close to the path in a wooded copse were cut back before the day. So out I went with Jill and Marilyn on the Friday morning and whilst they nailed in the way-markers I cut down the nettles. Sunday morning, with the sun shining, our walkers gathered in the paddock for a photo session with their dogs. Some of the walkers asked if they could walk a RATS dog and we were pleased to oblige, as were the dogs, all on their best behaviour. 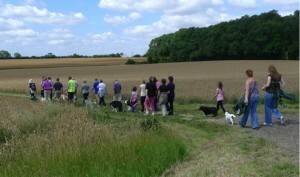 A long train of 50 walkers left Highfield for their 3 mile walk in the beautiful countryside around the kennels. With temperatures in the low twenties water was on hand for anyone requiring it (including dogs). Our volunteer Sid was the lead guide and Jill and Marilyn were at the rear to ensure we didn’t lose any slow-coaches. Everyone came back saying what a lovely walk it had been and how beautiful the countryside was.We arrived back to the smell of sizzling burgers and sausages and most of us were ready for our lunch. Everyone said how appreciative they were of our burger-master chefs Geoff and John (Speedy & Digger) who did a grand job. 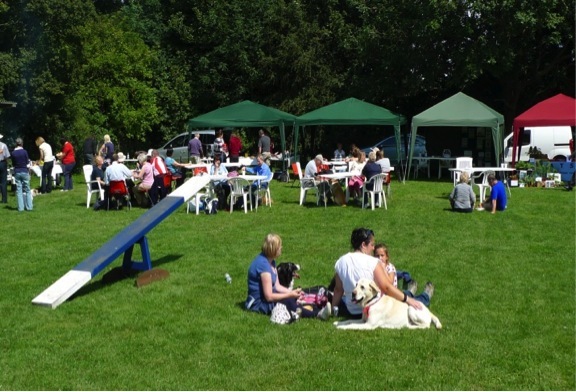 We also had our famous homemade cakes for sale and a selection of our stalls selling a variety of goods and there were prizes to be won on the tombola. We also had a special prize draw, for a child ,adult and dog, Megan won in the children’s section (a voucher for £20), George won in the adult section (a voucher for £30) and Trudy’s two Collies won in the dog section (a goody bag of treats). The treats were donated by Bronwin, and the vouchers to the value of £50 were donated by AdminRe. I hope you all noticed the three new benches and the two small tables. These were the result of a donation in memory of Elsie Bushell (one of our founder members) and a donation from friends of Daisy File.Small plaques will be attached when they have been engraved. We had hoped that John Bushell, Elsie’s brother, would be able to join us on the day so we could show him how we had spent their donation, but he was unable to attend. However he is coming up to see our purchases when he is able. I am sure that Elsie & Daisy will be looking down with pleasure at what they see. Also yesterday we were very pleased to welcome Daisy’s son & daughter and her friend that made the donation to join us for the walk and stay and enjoy the BBQ, they sat on the bench and really enjoyed their afternoon.One of the benches and one table will be located outside the meeting area so that our volunteer walkers will have somewhere to sit whilst they relax and chat after walking the dogs. Another of the benches has been placed alongside the training enclosure. One of our volunteers has named this the cuddle bench as it’s where she will sit and cuddle the dogs after a long walk and feed them the odd treat or two. The third bench has been placed further down the paddock.It was a very tiring day but the smiles on the faces of everyone told us that this was a successful day and many asked if we would be doing it again. Let us have a rest for a few weeks before we decide.At this point I must say our thanks go to Walter and Mandy for welcoming us all to Highfields. I would like to say a special thank you to everyone that was involved in the day, there are too many to mention but you know who you are. Everyone worked very hard to make it the success we know it surely was. This entry was posted in Community on April 10, 2012 by mattcrane.